Applications: The AACN Activated Carbon Neutralizer has been specifically designed to treat city water in residential and commercial applications. It is a Point of Entry (POE) system capable of treating all the water for a home or business. The AACN systems are designed to remove chlorine and chemical contamination, neutralize low pH, remove sediment, and sterilize the water against bacteria, viruses, and parasites. 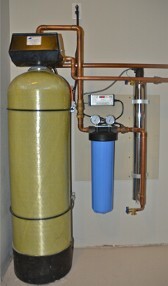 These systems produce excellent quality clean healthy water. The Process: The AACN Activated Carbon Neutralizer is an automatic backwashing tank type carbon filter with a post sediment filter and an Ultra Violet Sterilizer. Water entering the Carbon Neutralizer runs down through a bed of granular activated carbon mixed with a neutralizing media. Filtered water from the bottom of the media bed is collected and runs up a central distributor tube, out of the Carbon Neutralizer and through a graduated 1 micron sediment filter for fine sediment removal. The final stage of treatment is an Ultra Violet Sterilizer. The carbon neutralizer is automatically backwashed on a set schedule by the filter control valve. Backwashing cleans the carbon bed of collected sediment and particulate matter and also lifts and rearranges the bed for optimum filtration. Neutralization: Low pH, which is typical of many municipal waters, is corrosive to copper plumbing and plumbing fixtures. The neutralizing media added to the Activated Carbon Filter raises the pH of the treated water and drastically reduces its corrosive tendencies. This translates into big savings for maintenance and repair of plumbing systems and will prevent green staining of showers, tubs, and basins. Ultra Violet Sterilizer: Disinfection using ultraviolet (UV) light is fast becoming the ecological choice in disinfection techniques. UV effectively destroys microbial contaminants without adding anything to the water. UV creates no residual by-products and is effective against water-borne pathogens including bacteria, virus, and protozoa.